Attorney Jason S. Weiss, an associate at Wapner, Newman, Wigrizer, Brecher & Miller, P.C., is honored to be selected to the 2016 Super Lawyers: Rising Star list, distinguished for Medical Malpractice as a Plaintiff’s attorney. Jason takes great satisfaction in helping those who can’t fight for themselves. A true plaintiff’s attorney, his work in medical malpractice and his friendly, knowledgeable attitude have made him a client favorite. 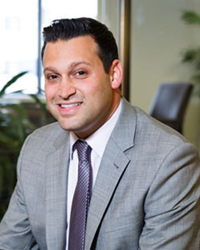 Well-known Eastern Pennsylvania injury law firm Wapner, Newman, Wigrizer, Brecher & Miller is pleased to have Associate Attorney Jason S. Weiss be recognized by Super Lawyers for inclusion on their 2016 Super Lawyers: Rising Star list. No more than 2.5 percent of the lawyers in each state are chosen, and the list is restricted to candidates that are either 40 years old or younger or have been in practice for 10 years or less. Mr. Weiss’ recognition comes in the practice area of Medical Malpractice. Mr. Weiss earned his Bachelor of Arts degree in Political Science from The George Washington University and his Juris Doctor degree from the Rutgers School of Law, where he was a member of the Rutgers Law Journal. He also served as a judicial extern to the Honorable Joel H. Slomsky of the U.S. District Court for the Eastern District of Pennsylvania and as a law clerk to the Honorable Michele M. Fox of the Superior Court of New Jersey. A member of the Philadelphia Trial Lawyers Association, Mr. Weiss was admitted to practice in the Commonwealth of Pennsylvania and the State of New Jersey in 2010. For over 35 years, the law firm of Wapner, Newman, Wigrizer, Brecher & Miller has been helping victims of serious personal injury and wrongful death receive the justice and compensation they deserve. We believe the personal approach is the most powerful one to pursuing any claim, and we give each client our complete attention. We serve personal injury victims throughout Pennsylvania and New Jersey, with offices in Philadelphia, West Conshohocken, Allentown, and Marlton. For more information or to get help with a potential claim, call 1-800-LAW-6600 (1-800-529-6600).